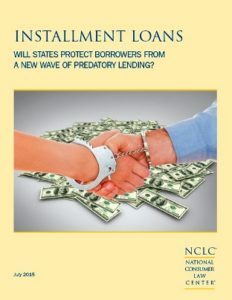 National Consumer Law Center > Issues > Installment Loans: Will States Protect Borrowers from a New Wave of Predatory Lending? Installment Loans: Will States Protect Borrowers from a New Wave of Predatory Lending? This National Consumer Law Center survey analyzes the strengths and gaps of the statutes in 50 states and Washington, D.C. that regulate installment loans, a market that is expected to grow as restrictions on payday loans increase. Why Cap Small Loans at 36%? The state laws that govern installment loans have received little attention in the past decades. Credit cards, where state law is largely preempted, are the most widespread source of small-dollar credit, and the federal-level reforms of 2009 eliminated many of the abusive credit card practices that had arisen. In the subprime and deep subprime market, policymakers have focused on the harms of payday loans. Dangerous installment loans have flown under the radar, a market that is expected to grow as restrictions on payday loans increase and payday lenders evolve to evade protections. The interest rate caps and other protections that state installment loan laws provide for consumers will therefore be of great importance over the coming years. Do state installment loan laws protect consumers, or will gaps in the laws provide a haven for high-cost lenders? Even if the interest rate is lower than on a payday loan, an installment loan can cause as much or more damage if it has a high rate applied to a larger amount for a longer period of time. This report analyzes the strengths and weaknesses of state laws that regulate installment loans and similar longer term loans structured as open-end lines of credit. We survey the key features of these laws and analyze the full cost permitted in each state for two sample loans, a six-month $500 loan and a two-year $2000 loan. To analyze the cost of these loans, we have calculated full annual percentage rates (“full APRs”) that include all fees. Caps on interest rates and loan fees are the primary way in which state laws protect borrowers. Reasonable interest rates align the interests of the lender and the borrower and provide an incentive to make loans that borrowers can afford to repay. But state installment loan laws vary greatly as to whether they cap rates, and how effective the rate caps are with fees and other loopholes included. Some state laws place an ostensibly reasonable limit on the interest rate, but also allow other loan charges such as origination fees. These fees can dramatically increase the full APR. For example, Louisiana caps the interest rate for a $500 loan at 36%, but also allows a $50 origination fee and a $20 documentation fee, bringing the full APR to 85%. Other states permit the ruse of a fee paid to a broker—a credit services organization (CSO)—on top of the purported loan rate. For example, unlimited CSO fees make Ohio’s limits on loan charges illusory. 4 states have no rate cap or ban on unconscionability at all. States almost always impose lower rate caps for larger loans, which is appropriate. Rate caps are often structured based on tiers of credit. For example, Iowa’s Regulated Loan Act caps interest at 36% on the first $1,000, 24% on the next $1800, and 18% on the remainder. The resulting APR, which blends these rates, is 31% on a $2000 loan. 5 states have no rate cap at all. In some states, the rate caps and the full APRs we have calculated are not airtight, because the state has looser rules for open-end lines of credit. (Open-end credit—a credit card is the prime example—does not have a fixed loan amount or term). Of the 44 states whose non-bank lending statutes specifically allow open-end credit, some do not cap interest rates, and some have rate caps but do not have unambiguous, airtight caps on the fees that lenders can impose. Because of these unclear limits, we were unable to calculate full APRs for these states. The remaining states cap both rates and fees, but the caps vary greatly. An extreme case is Tennessee, which enacted an open-end credit law in 2014 that purports to limit interest to 24%, but allows a daily charge that brings the full APR up to 279%. Provisions like these give lenders an incentive to structure loans as open-end in order to evade rate caps on installment loans. 14 states fail to cap rates for a $500 cash advance and 16 fail to cap rates for a $2000 advance. 14 states have rate caps but do not have unambiguous, airtight caps on the fees that lenders can impose for a $500 cash advance, and 13 fall into this category for a $2000 advance. For a $500 cash advance, 4 states cap the full APR at 36% or less, 7 cap it between 39% and 54%, 4 cap it at 59% to 89%, and Tennessee caps it at 279%. For a $2,000 cash advance, 11 states cap the full APR at 36% or less, 3 states cap it between 39% and 42%, and Tennessee caps it at 279%. Most states permit charges for credit insurance and other add-on products, which can significantly add to the cost of the loan, often without providing any benefit. Or state laws may not stop lenders from increasing the cost of credit in a nearly invisible way through loan-flipping, new fees, and archaic formulas for allocating payments to principal, interest, fees, and add-on charges. Considering both closed-end installment loans and open-end credit, the implications as payday loans evolve are mixed. Of the 36 states that currently allow payday lending, including hybrid states that impose some limits, only three states have solid rate caps of 36% or less for a $500 loan or line of credit. Ten payday states have caps up to 48%, but some permit fees that could drive the full APR higher. The other 23 payday states have even weaker protections against a high rate $500 installment loan or line of credit. The non-payday states do better but are not without risks. Of the 15 jurisdictions (14 states and the District of Columbia) that do not allow payday lending, 10 cap the rate for a $500 loan or credit line at 18% to 38%, though some states do not have firm caps on fees for open-end credit. Five non-payday states permit rates of 54% to 65% for a $500 loan. Many states place maximum term limits on loans. For a $1,000 loan, 23 statutes have term limits that range from 18 to 38 months. Three other statutes have limits that range from 4 to 8 years, and the other states have no term limit. that a lender can take, but usually these restrictions apply only to very small loans, such as those under $700. Place clear, loophole-free caps on interest rates for both installment loans and open end credit. A maximum APR of 36% is appropriate for smaller loans, such as those of $1000 or less, with a lower rate for larger loans. Prohibit or strictly limit loan fees, which undermine interest rate caps and provide incentives for loan flipping. Ban the sale of credit insurance and other add-on products, which primarily benefit the lender and increase the cost of credit. Require full pro-rata or actuarial rebates of all loan charges when loans are refinanced or paid off early and prohibit prepayment penalties. Limit balloon payments, interest-only payments, and excessively long loan terms. An outer limit of 24 months for a loan of $1000 or less and 12 months for a loan of $500 or less might be appropriate, with shorter terms for high-rate loans. Require lenders to ensure that the borrower has the ability to repay the loan according to its terms, in light of the consumer’s other expenses, without having to borrow again or refinance the loan. Prohibit devices, such as security interests in household goods, auto titles and postdated checks, which coerce repayment of unaffordable loans. Employ robust licensing and public reporting requirements for lenders. Tighten up other lending laws, including credit services organization laws, so that they do not serve as a means of evasion. Minimize differences between state installment loan laws and state open-end credit laws, so that high-cost lenders do not simply transform their products into open-end credit. Make unlicensed or unlawful loans void and uncollectible, and allow both borrowers and regulators to enforce these remedies. In theory, installment loans can be safer and more affordable than balloon payment payday loans. But states need to be vigilant to prevent the growth of larger predatory loans that can create a debt trap that is impossible to escape.